On 31st May 1910 the Union of South Africa was born. The former colony of the British Empire because a semi-independent colony. On 31st May 1961 the Republic of South Africa was declared, and we were no longer a colony but an independent racist state. In 1994 we got rid of legalised racism, but retained our glorious history of bungling government bureaucratic inefficiency. In 2007 one aspect of this bureaucratic nightmare got a new name (eNatis) and two years later it's still eBroken. The queue above takes about an hour or so to process. There are big signs saying that the credit card machines don't work, and that they don't accept R200 notes either. Notice the TV in the top left of the picture. It used to display adverts to its captive audience, but that's broken too. There is a much shorter queue on the right for windows 11-13, where they will accept payment of traffic fines, but nothing else. I got the traffic fine because of the length of the other queue. Because I paid the fine first I couldn't pay the license fee. Go figure. I tried to enter this door to get my Driver's License renewed, but they wouldn't let me in. I think they have more security guards than employees. Apparently their fancy new eNatis system isn't working and they are only processing 100 people per day. Doors open at 7.30 but get there early. The sign on the door says they closed yesterday at midday, but by 11am today they were turning people away. never mind the economic impact of denying people a valid driver's license. After all, the fine for an invalid one is a mere R1200. I will try to go back tomorrow. 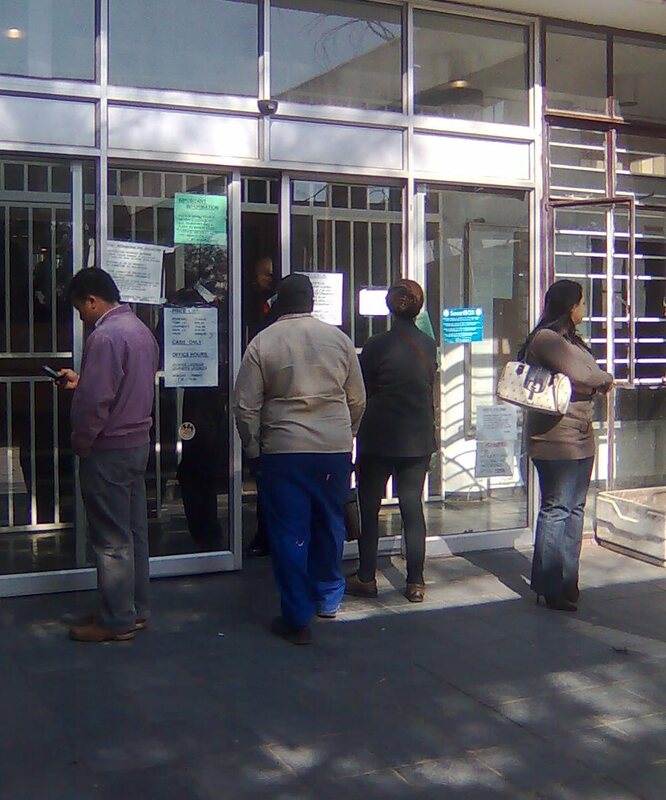 One of the "benefits" of the eNatis system is that you can go to the Post Office to renew the license. The queue was a little shorter, but still took about an hour. The difference was that there was only 1 terminal instead of 5 or 6 (out of 10 counters) at the Licensing Department, and the Post Office employee complained that if she typed too fast the system bombed out. 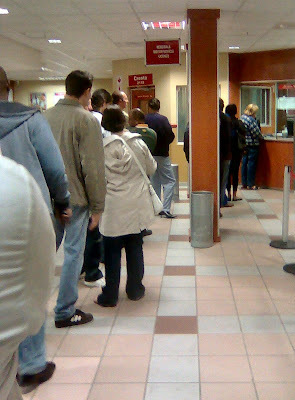 Now for a Post Office person to complain about a slow system speaks volumes, since they aren't that fast themselves.